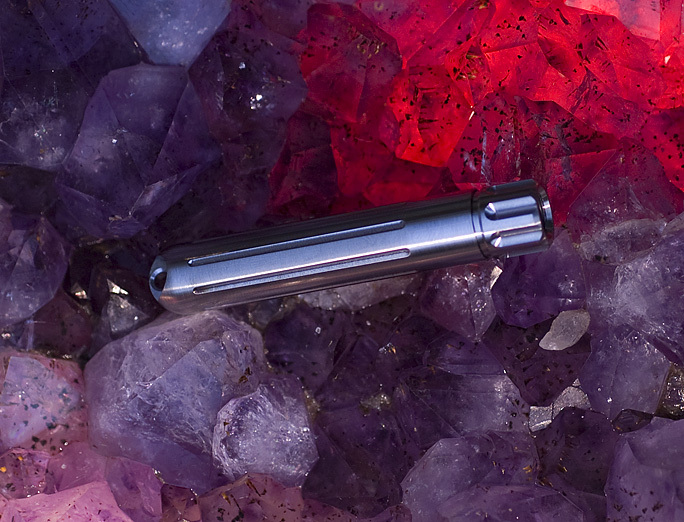 The original Sapphire uses a converter I purchased from Arc Flashlights driving a Nichia 3 mm DS LED. The Sapphire 25 uses a constant current driver designed and manufactured for me in Japan by the same folks who have provided me with the 3S converters I am using in other lights currently. The new converter is set at 25 mA constant current to the LED and the input voltage range for it is ~1V up to ~5V. This means that this converter will drive the LED at the target 25 mA whether regardless of the type of AAA battery used and it would even function properly on 2xAAA or a Li-Ion cell. The trace on both sides of the board is gold plated including any contact surfaces to enhance the ground path. I solder a .5 mm thick sterling silver ring on the PCB for the anode contact. 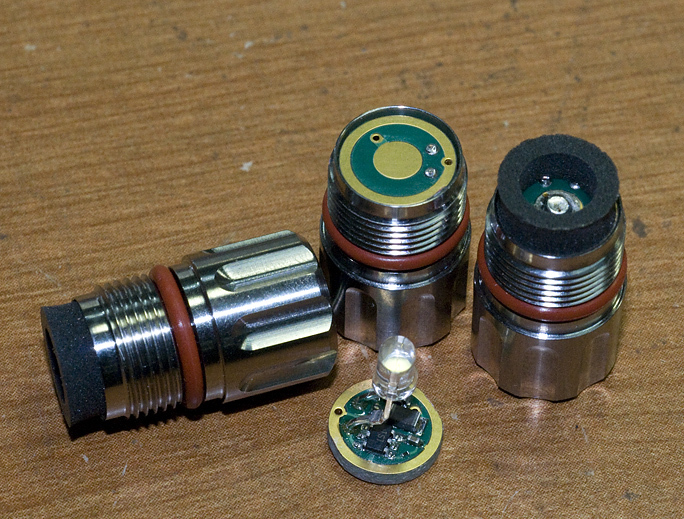 The converter assembly (light engine) is retained in the head by virtue of an interference fit and seal around the 3 mm LED. It can easily be pulled out of the head if the need arise. You will also notice that the LED does not sport a large cap as is the case with the ARC converter. I should state that I have no issues with the ARC converter and for all I know it may be a more efficient converter. It certainly has a lot of history and a long track record! 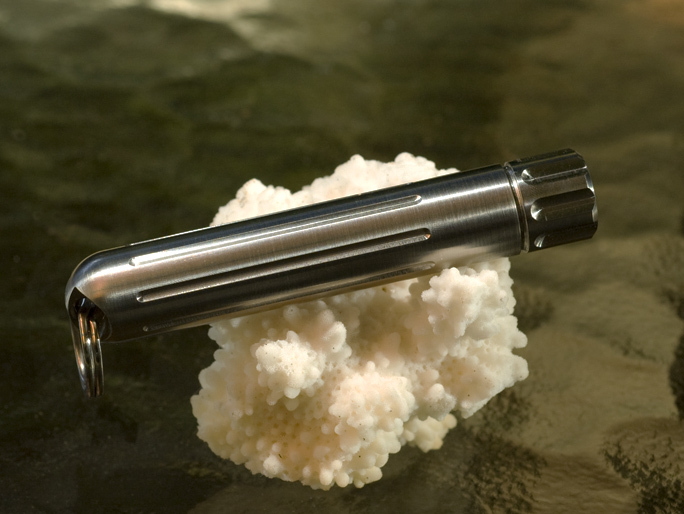 My primary reasons for going with a new converter are the desire to have a source independent of another flashlight manufacturer, hopefully a converter less sensitive to contact resistance and a converter that is constant current across the voltage range of the various batteries, likely to be used. I have been using a couple of these Sapphire's for a number of months now with pre-production converters and I am quite pleased with the performance of them. For all intents and purposes, I consider this light to be a Sapphire but I feel I should make a distinction because of the new converter and since the new converter is set via a sense resistor to be at 25 mA I figure calling it a Sapphire 25 makes some sense. I left the test run overnight having started it at about 10 AM and the next day, 22 hours later, the LED was still lit but at about .2 lumens or so. The important consideration was that the converter did not shut off but allowed the LED to carry on as best it could. You can see with the sample tested, the IS measured 5 lumens out the front. I don't know how accurate the IS is in testing the Sapphire but I am confident that the results are well with the realm of the population of these lights. Don, that is a nice mostly flat runtime there. Would you do a runtime with an Eneloop, or other LSD AAA? I can imagine that you might not want to monitor a NiMh AAA through its runtime to avoid over discharging. That's a pretty nice runtime graph on alkaline batteries. I assume there will be longer and flatter runtime on lithium and rechargables. My laptop was dedicated and away from the printers for almost 24 hours to create this one run time because I figured folks would want an idea of what to expect. I personally use the lithium AAA's in these lights. I don't have any rechargeable AAA batteries and candidly have no interest or desire in getting some or doing additional runtime tests. I would not be surprised if some of the variation seen in the first four hours of the graph isn't due to ambient temperature variations in the room where the test was conducted. I leave run time tests to the experts. If anyone every wants to get a runtime of this jewel when it's released, let me borrow it and I'd be happy to do so. What was the current setting on the original driver? Do you happen to know what the current rating is on the Arc Ti AAA as well? Others are better suited to answer this question. As I understand it, converter from ARC is not a constant current driver and the current to the LED is a function of V-in . I believe on a fresh battery the current could be as high as 60 mA but then drops as the voltage to converter drops. To my knowledge, the present converter in the ARC AAA is the same converter used in the ARC Ti AAA and this is the converter I used in the Sapphires I have built, to this point. This converter has a long track record and many have experience with it in use. Oh, I see, you didn't just turn down current on the "stock" Sapphire driver, you actually replaced it with a different driver. Great work Don. Lost my original sapphire a few months ago. Can't wait to pick one of these up. So how does the 25 compare to the original Sapphire in terms of real world performance (brightness, beam shape, runtime, etc.) ? Any noteworthy distinctions? -great question. I might add tint and dare I say, price? There is an offering for these, HERE. The real world difference is only in output brightness. I am using the same LED's in these as the original Sapphire. I gave serious thought to getting some warmer tinted Nichias as well but for this type of light and based on some opinions I was given off the forum, I decided not to add a second flavor and complicate things at the inventory and assembly level. If it seems that there is enough demand or concern for a warm tint version, I might do a small run of them at some future time. The converter actually has a tiny flea poop size sense resistor that sets the current level. I understand it has a max drive level of 40 mA. Thanks Don. My keychain will soon be whole again. Hey Don, any chance of converting a Sapphire to a Sapphire 25? I still get the occasional flickering on my Sapphire. If you are having issues with your Sapphire, please contact me and we can see about getting it sorted out. I have found that with some of them I needed to enhance the ground path contacts via the silver solder blob crimps. It is my hope that this new converter and its gold trace along with it's different circuit design will be less sensitive to contact resistance and such but the proof will be in the performance of these once they are out in the field. Hrm. Well, I see that most of the 5mm LEDs on LEDSupply are rated @ 20mA, so I guess that's actually a useful amount of current. I thought 5mm LEDs actually ran closer to 100mA; shows what I know. Is your source for these capable of making small batches? I could probably do some interesting things with some of these drivers set a bit higher. Wow, this is interesting, a buck-boost converter in a 1aaa light? I do believe from that graph that there may be some efficiency loss compared with the Arc converter, but the graph is certainly acceptable. One thing I wonder is whether the oscillator can start when the battery is very low, i.e. whether you can run the light til it's quite dim, then still be able to turn it on and off; also, whether it has the "recovery" characteristics of the Arc (run light til battery is dead, turn off, wait 5 minutes, and the light is good for another 1/2 hour of operation or so--repeat until bored). I know Fred (Photon Fanatic) used some MJ converters in his TI Killer series, which he has unfortunately discontinued due to not liking the Nichia GS led. How feasible is it to disassemble the Sapphire 25, if there got to be a reason for replacing the converter and/or led? Based on his own description, disassembly would consist of melting the solder in one of the epoxy fill holes, blowing it away with compressed air, and then using tiny pliers to hold the LE by the fill holes and then wiggling the LE out of the head. I have no idea how this converter compares in terms of efficiency with the ARC converter. I know Peter told me that the ARC converter is quite efficient and more efficient than a constant current converter. I have a zip lock bag where I put my dead batteries and I just grabbed two Duracell AAA's out of it and I believe one was the one that I used in the run test above. Both fired up the LED in my Sapphire 25. No idea how long they would stay lit but they did fire up and not trivial in brightness. The converter does behave as a buck/boost converter and on the bench, I found I could take it up to 5 V-in which got me thinking the converter could be used with a USB power source and possibly a keyboard light driver on a LapTop. I was told through translation by the designer that a 5V source could have spikes that would damage the converter and that the USB idea was not a good one. 3 AAA batteries in series though should be fine as well as a Li-Ion. With a max output current of 40 mA though, this particular driver is limited in scope when considering any scaling up and possibly using it with 1/2 watt or more powerful LED's. It was designed specifically for the Sapphire AAA format and single lamp style LED and it seems to be quite effective in its intended application. The only thing holding these LE's in the head is the interference seal of the LED in the O-ring. You can carefully grab the foam cushion and pull the LE out of the head. If the foam cushion were to pull off the PCB then there is a small ground path via at the perimeter that you can put a needle in and use as a lifting pin by cocking it off angle and pulling it up. You could also remove the window and just push the LED out. These LE's are not potted nor are they staked with a solder blob as I did with the original Sapphires. LED replacement would be rather straight forward with the necessary skill and soldering equipment. USB voltage is very tightly-filtered; from the wall, it goes through the computer's power supply and then again through the motherboard's power conditioner. If there were any 5V source that were safe to use with this driver, it would be USB. However, I'd still wire a capacitor in-parallel with the driver just for that extra measure of safety, and to absorb even the tiniest surge when the device is first plugged in. Alternately, though I realize it isn't as much fun, Dell sells laptops with backlit keyboards now. I've equipped a few of my coworkers with said laptops, and they've found them to be indispensable when working at night and/or on airplanes. I wanted to put in a little vote here for a future warmer tinted run. Thanks Don! I know they were a PITA to do as you said... But a hi-cri saphire would be wicked!!! I found the Arc converter inefficient as the converter from the Fenix E01 ran nearly twice as long. The converter in the Arc AAA is actually very efficient; the shorter runtime is due to the extremely-simple converter's inability to regulate current flow to the emitter, so when the battery is new the LED basically gets all the current it can handle and a little more just in case. That causes the battery to drain faster, but it also makes the converter more flexible as it's capable of driving more power-hungry LEDs than the E01 driver or the Sapphire 25 driver can. Each has its place in the world -- I've modded my Ti Arc AAA driver with an LED from PhotonFanatic and I'm absolutely thrilled to pieces with it. I've never seen better fill from a 5mm LED. Couldn't run it on a Sapphire 25 driver though, because 25mA is barely enough to wake up the emitter in that LED. 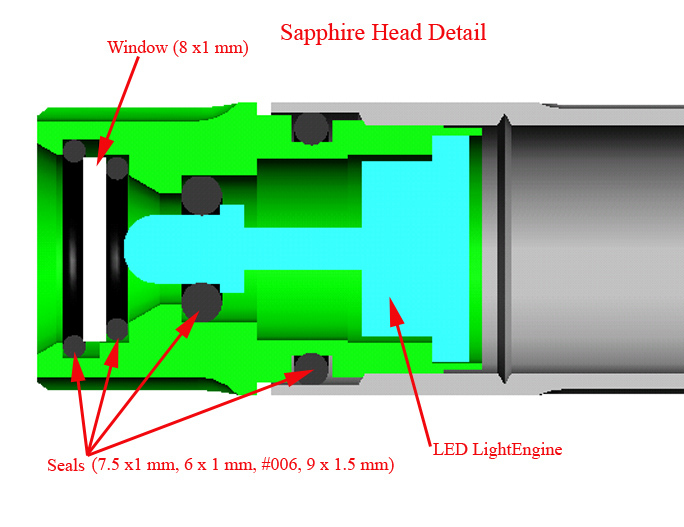 But, I'm happy to hear the Sapphire 25's casing offers similar flexibility in swapping light engines, because it means more people can have fun mixing and matching in the future. 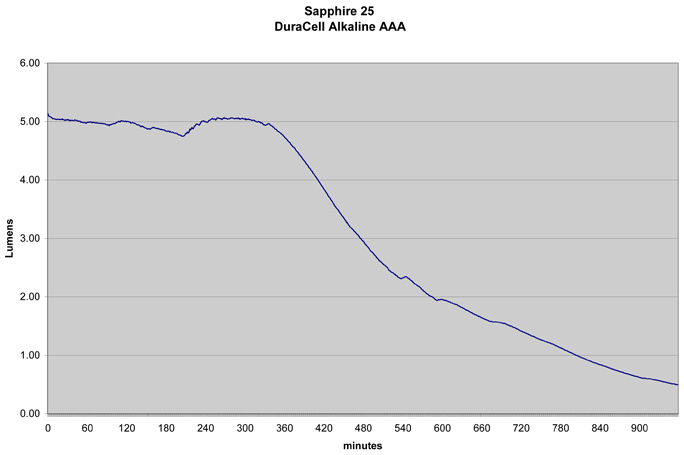 So will the Arc offer a longer tail after the 50% point compared to the Sapphire 25 circuit? What an awesome, awesome little light! I am not much for AAA lights, but for this one I make an exception. Sure, I know the Arc AAA is out there, too, but this is a McGizmo!! Bravo Don - I think I may have found a new source of Christmas gifts!